The prognosis and management of patients with LG severe AS is not clear so far. In order to better characterize this subset of AS patients, we studied the clinical and echocardiographic characteristics of patients with severe AS and preserved LVEF, according to the recently proposed fl ow-gradient classification4. European Association of Echocardiography recommendations10. Left ventricular volumes and LVEF were measured using the modifi ed Simpson’s rule from apical four- and two-chamber views and were normalized to body surface area (BSA). LV mass was calculated by the equation of Devereux11 and indexed to BSA. The degree of calcifi cation of the aortic valve was assessed using the classifi cation proposed by Rosenhek et al. : 1, no calcification; 2, mildly calcifi ed (small isolated spots); 3, moderately calcified (multiple larger spots); and 4, heavily calcified (extensive thickening and calcification of all cusps)12. Figure 1. The illustration of LV longitudinal deformation measured off-line in 17 segments using a 2D strain software in a patient with severe aortic stenosis. 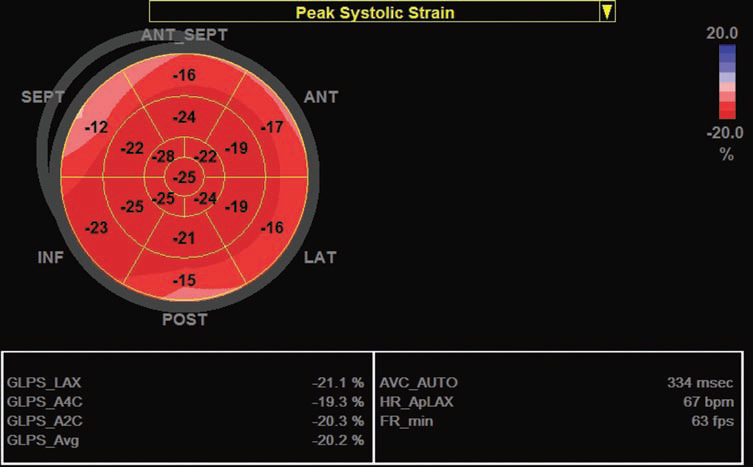 Global longitudinal strain is within normal range in this patient (-20%). LV. This was feasible in 133 pts with an adequate acoustic window. as BNP serum values were logarithmically transformed and logBNP values were used in comparative analyses. Student t tests were used to compare continuous variables, and Pearson 2 or Fisher exact tests were used to compare categorical variables between groups. patients, those having NF/LG were less symptomatic, with a lower prevalence of angina and syncope and a lower NYHA class. The clinical characteristics of these two groups are shown in Table 2. The serum BNP values were available in 76 patients – range 11-4059 pg/ml, median value 207 pg/ml (86-334). Patients with NF/HG had significantly higher BNP values compared to NF/LG patients (p=0.03). diameters (20.4±1.6 vs. 21.2±2.1 mm, p=0.04). The echocardiographic parameters of LV systolic and diastolic function in patients with NF/LG -AS and NF/HG-AS are presented in Table 3. Patients with NF/ LG had lower indexed LV mass (p=0.002) and smaller LV volumes (p<0.004) when compared to NF/HG pts. 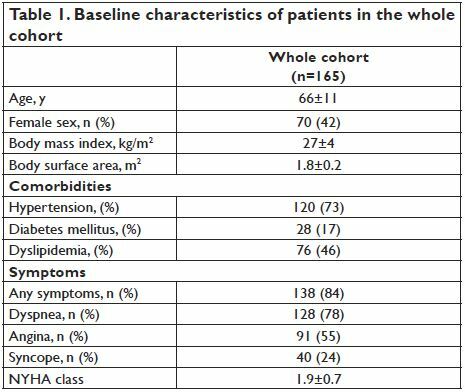 Although LVEF was similar between groups (62±6 vs. 61±6%, p=0.6), worse parameters of LV longitudinal and diastolic function were found in NF/HG compared to NF/LG patients. Compared to patients with NF/LGAS, lower systolic myocardial velocities and a more impaired global longitudinal deformation were found in patients with NF/HG-AS, revealing a poorer LV systolic function.These patients had also larger indexed left atrial volumes (p=0.02) and higher E/e’ ratios (p=0.03) indicating a higher degree of LV diastolic dysfunction. diameters ≤2.2 cm, the majority of patients with AVA <1cm2 have a mean gradient below 40 mm Hg. This is important for the illustration of the discordance that exists in currently used AS severity criteria. The prognosis of patients with low gradient AS and their management are still controversial17. Our results demonstrate that these patients have a lesser degree of LV hypertrophy, a milder impairment of LV longitudinal deformation and lower E/e’ ratio suggesting lower LV filling pressures. These data suggest that patients with NF/LG AS may, in fact, have moderate AS with a milder degree of LV dysfunction. Given the lower prevalence of symptoms in this subset of patients, we suggest that a lower AVA cut-off value should be used to define severe AS. clinical implications to the previously published research. Nevertheless, it is likely that the prevalence of LF/ LG-AS patients was underestimated in our study since we have excluded patients with atrial fibrillation and/ or associated mitral valve disease, although our results are similar to that reported by Eleid et al in a larger series15. In a relatively large number of patients with severe isolated AS and preserved LVEF, we found a very low prevalence of paradoxical low fl ow low gradient AS. According to the proposed flow-gradient criteria, most patients with low gradient severe AS have a normal transvalvular fl ow. These patients have a better clinical and echocardiographic profi le when compared to patients with high gradient severe AS. These fi ndings have potential implications for the assessment of AS severity and consequent management. Acknowledgements: This work was supported by a grant of the Romanian Ministry of National Education, CNCS – UEFISCDI, project number PN-II-IDPCE- 2012-4-0560 (contract 21/2013) and by the Sectoral Operational Programme Human Resources Development (SOP HRD), financed from the European Social Fund and by the Romanian Government under the contract number POSDRU/159/1.5/S/132395. We gratefully acknowledge the support of our colleagues who have referred patients for this study. 1. Iung B, Baron G, Butchart EG, Delahaye F, Gohlke-Bärwolf C, Levang OW, Tornos P, Vanoverschelde JL, Vermeer F, Boersma E, Ravaud P, Vahanian A. A prospective survey of patients with valvular heart disease in Europe: the Euro Heart Survey on valvular heart disease. Eur Heart J 2003; 24: 1231–1243. 2. Vahanian A, Alfi eri O, Andreotti F, Antunes MJ, Barón-Esquivias G, Baumgartner H, Borger MA, Carrel TP, De Bonis M, Evangelista A, Falk V, Iung B, Lancellotti P, Pierard L, Price S, Schäfers HJ, Schuler G, Stepinska J, Swedberg K, Takkenberg J, Von Oppell UO, Windecker S, Zamorano JL, Zembala M. Guidelines on the management of valvular heart disease (version 2012): the Joint Task Force on the Management of Valvular Heart Disease of the European Society of Cardiology (ESC) and the European Association for Cardio-Thoracic Surgery (EACTS). Eur Heart J 2012;33: 2451–2496. 3. Nishimura RA, Otto CM, Bonow RO, Carabello BA, Erwin JP 3rd, Guyton RA, O’Gara PT, Ruiz CE, Skubas NJ, Sorajja P, Sundt TM 3rd, Thomas JD. 2014 AHA/ACC guideline for the management of patients with valvular heart disease: executive summary: a report of the American College of Cardiology/American Heart Association Task Force on Practice Guidelines. J Am CollCardiol 2014;63:2438-2488. 4. Dumesnil JG, Pibarot P, Carabello B. Paradoxical low fl ow and/or low gradient severe aortic stenosis despite preserved left ventricular ejection fraction: implications for diagnosis and treatment. Eur Heart J 2010;31:281–289. 5. Baumgartner H, Hung J, Bermejo J, Chambers JB, Evangelista A, Griffin BP, Iung B, Otto CM, Pellikka PA, Quiñones M. Echocardiographic assessment of valve stenosis: EAE/ASE recommendations for clinical practice. J Am SocEchocardiogr 2009;22:1–23. 6. Clavel MA, Messika-Zeitoun D, Pibarot P, Aggarwal SR, Malouf J, Araoz PA, Michelena HI, Cueff C, Larose E, Capoulade R, Vahanian A, Enriquez-Sarano M. The complex nature of discordant severe calcified aortic valve disease grading: new insights from combined Doppler-echocardiographic and computed tomographic study. J Am Coll Cardiol 2013;62:2329–38. 7. Kadem L, Dumesnil JG, Rieu R, Durand LG, Garcia D, Pibarot P. Impact of systemic hypertension on the assessment of aortic stenosis. Heart 2005;91:354–61. 8. Minners J, Allgeier M, Gohlke-Baerwolf C, Kienzle RP, Neumann FJ, Jander N. Inconsistent grading of aortic valve stenosis by current guidelines: haemodynamic studies in patients withapparently normal left ventricular function. Heart 2010;96:1463–8. 9. Zoghbi WA. Low-gradient “severe” aortic stenosis with normal systolic function: time to refi ne the guidelines? Circulation 2011;123:838– 40. 10. Lang RM, Badano LP, Mor-Avi V, Afi lalo J, Armstrong A, Ernande L, Flachskampf FA, Foster E, Goldstein SA, Kuznetsova T, Lancellotti P, Muraru D, Picard MH, Rietzschel ER, Rudski L, Spencer KT, Tsang W, Voigt JU. Recommendations for cardiac chamber quantification by echocardiography in adults: an update from the American Society of Echocardiography and the European Association of Cardiovascular Imaging. Eur Heart J Cardiovasc Imaging 2015;16:233-270. 11. Devereux RB, Alonso DR, Lutas EM, Gottlieb GJ, Campo E, Sachs I et al. Echocardiographicassessment of left ventricular hypertrophy: comparison to necropsy findings. Am J Cardiol 1986;57:450–8. 12. Rosenhek R, Binder T, Porenta G, Lang I, Christ G, Schemper M, Maurer G, Baumgartner H. Predictors of outcome in severe, asymptomatic aortic stenosis. N Engl J Med 2000;343:611-7. 13. Zoghbi WA, Farmer KL, Soto JG, Nelson JG, Quinones MA. Accurate noninvasive quantification of stenotic aortic valve area by Doppler echocardiography. Circulation 1986;73:452–9. 14. Ommen SR, Nishimura RA, Appleton CP, Miller FA, Oh JK, Redfield MM, Tajik AJ. Clinical utility of Doppler echocardiography and tissue Doppler imaging in the estimation of left ventricular fi lling pressures: a comparative simultaneous Doppler-catheterization study. Circulation 2000;102:1788-94. 15. Eleid MF, Sorajja P, Michelena HI, Malouf JF, Scott CG, Pellikka PA. Flow-gradient patterns in severe aortic stenosis with preserved ejection fraction: clinical characteristics and predictors of survival. Circulation 2013;128:1781-9. 16. Michelena HI, Margaryan E, Miller FA, Eleid M, Maalouf J, Suri R, Messika-Zeitoun D, Pellikka PA, Enriquez-Sarano M.Inconsistent echocardiographic grading of aortic stenosis: is the left ventricular outflow tract important? Heart 2013;99:921-931. 17. Jander N, Minners J, Holme I, Gerdts E, Boman K, Brudi P, Chambers JB, Egstrup K, Kesäniemi YA, Malbecq W, Nienaber CA, Ray S, Rossebø A, Pedersen TR, Skjærpe T, Willenheimer R, Wachtell K, Neumann FJ, Gohlke-Bärwolf C. Outcome of patients with low-gradient “severe” aortic stenosis and preserved ejection fraction. Circulation 2011;123:887-895.